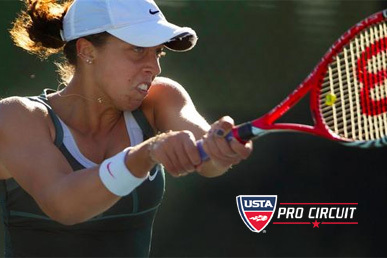 Phoenix Country Club - Phoenix, Ariz.
PHOENIX - Seventeen year old Madison Keys is slowly making her move towards the upper echleon of the women's pro game. The tall teen took one giant step closer to that with perhaps her most significant pro victory to date, capturing the USTA Pro Circuit $75K Goldwater Women's Tennis Classic at the Phoenix Country Club in Phoenix, Ariz.
Keys (right) ran roughshod over her competition all week in Phoenix, which featured former Top 50 WTA Tour-ranked players Bethanie Mattek-Sands, Jill Craybas, Melanie Oudin, and Mirjana Lucic, as well as current world No. 1 junior Taylor Townsend. Keys, who was unseeded at the Goldwater event despite her ranking at 153, started off her five-match run to the title with an easy 6-1, 6-2 win over Romana Tedjakusuma of Indonesia. She followed that up with a 6-3, 7-5 defeat of Mattek-Sands in the second round, then powered through the fifth-seeded Lucic 7-5, 6-1.
in the semifinals, Keys breezed past Canada's Sharon Fichman 6-1, 6-3 to set up an a final against fellow American and eight-seeded Maria Sanchez . Sanchez, 23, and a former All-American at University of Southern California, had taken out top-seeded Camilia Giorgi (No. 79 on WTA Tour) in the quarters, rebounding from a bad first set to prevail 1-6, 6-0, 7-5. She disposed of Canada's Gabriela Dabrowski in the semifinals 6-2, 6-2 to reach her finals spot opposite Keys. In the final against Sanchez, Keys' serve was the weapon the former Trojan had the most difficulty neutralizing. Keys waltzed through the first set after getting an early break, closing out with an ace at 6-3. The second set turned into more of a tussle, with Sanchez bearing down grabbing an early lead and getting to the brink of evening the match with a 5-3 lead. But Keys broke in the next game, then leveled at 5-5. The two young Americans both held to force a tiebreaker, which Keys rattled off quickly at 7-1 for her biggest win to date. The Phoenix victory was Keys' second professional victory in three weeks, after taking an indoor $50K title in Saguenay, Canada in late October. With the victory, Keys' ranking should rise to around 130, which gets her within shouting distance of making direct entry into Grand Slam events in 2013. Americans Jacqueline Cako and Natalie Pluskota defeated Eugenie Bouchard of Canada and Ulrikke Eikeri of Norway. Cako, a junior at Arizona State, has now won six doubles titles on the Pro Circuit tour. Photo courtesy of Patrick Breen, Arizona Republic.